A law banning magic mushrooms and making them a class A drug has come into force. 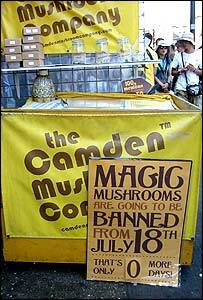 The Drugs Act 2005 ends the situation in which fresh magic mushrooms were legal but those which were dried or prepared for use were not. 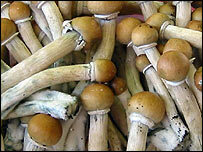 Sellers have condemned the move, saying mushrooms are not harmful and accusing ministers of a knee-jerk reaction. But the Home Office said the drug was harmful to some users and added the move clarified the existing law. Home Office Minister Paul Goggins said in a statement: "Magic mushrooms are a powerful hallucinogen and can cause real harm, especially to vulnerable people and those with mental health problems. "The law has not been clear with regard to the status of fresh magic mushrooms and some have tried to exploit this apparent loophole." Magic mushrooms, more properly known as psilocybe, contain the psychedelic chemicals psilocybin and psilocin. These chemicals were already class A but previously the law did not apply to fresh or raw magic mushrooms which contain far less of the drug gram-for-gram than when dried. Under Clause 21 of the Drugs Act 2005, it is now an offence to import, export, produce, supply, possess or possess with intent to supply magic mushrooms, including in the form of grow kits. Exceptions will be made for people who unknowingly pick the mushrooms in the wild or find them growing in their garden, and critics have argued the act will be difficult to police. Magic mushrooms have risen in popularity dramatically in recent years, especially since becoming openly available over the internet or at about 400 "headshops" around the country. According to Home Office figures, use of the fungi has risen 40% in a year, with more than quarter of a million people estimated to have taken them in 2003/04, compared with 180,000 in 2002/03. However, they still represent a tiny proportion of all drug use. Although some psilocybe mushrooms do grow in the wild, the vast majority of mushrooms sold on the open market come from mushroom farms in Holland. Users of fresh mushrooms experience effects ranging from giggling fits and intensification of colours, lights and sounds to, more rarely, hallucinations. Negative effects can include vomiting, and anxiety. Critics of the ban say that the mushrooms are harmless to physical health and would only be bad for people with existing mental health problems. "Obviously I would not suggest someone with schizophrenia took magic mushrooms but nor should they probably take alcohol," said Chris Bovey, owner of online retailer Potseeds, based in Totnes, Devon. "Our customers feel patronised by the government, victimising them for doing something harmless and enjoyable in their own homes, just because they need to sound tough on drugs." Others fear that the ban could mean an increase in accidental poisonings as people go foraging for mushrooms in the wild and mistakenly pick a toxic variety. Mushroom retailers have formed the Entheogen Defence Fund and plan to launch a legal challenge to the change in the law, saying it contravenes European trade rules and the 1971 Vienna convention. Mike Bashall, chairman of the EDF said: "We would have welcomed regulation because through regulation you do get control - as with alcohol. "This is a badly-drafted piece of legislation that was pushed through the House of Lords without proper scrutiny or discussion." A spokeswoman for drugs information body Drugscope said the government did need to clarify the law on magic mushrooms but should not have made them class A. "To see magic mushrooms alongside crack cocaine and heroin doesn't seem proportionate," said Petra Maxwell. "Now that they're class A if people are found in possession the ultimate, if unlikely, sanction is seven years in prison and a fine." The law change does not affect another, much more rarely used magic mushroom: Amanita muscaria - more commonly known as Fly Agaric.